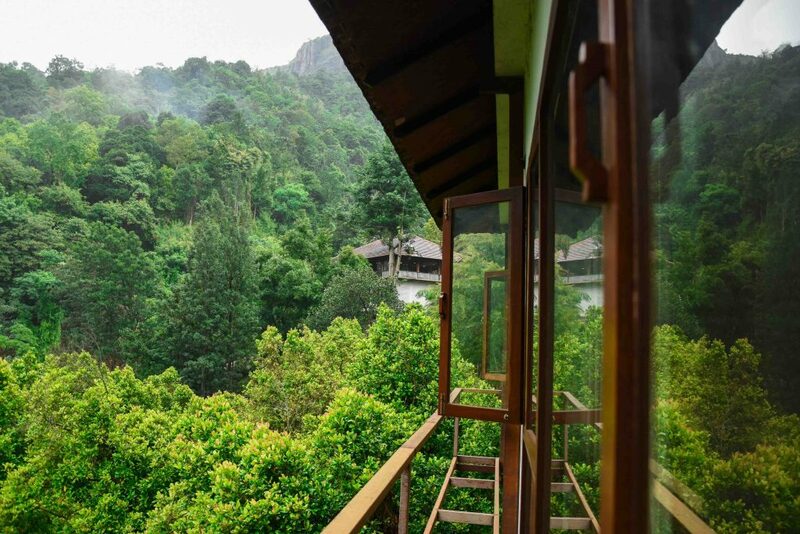 Set yourself among scenery untouched by humans with chirping sounds of birds. Kurumba Village Resort is a destination to unwind and rejuvenate. 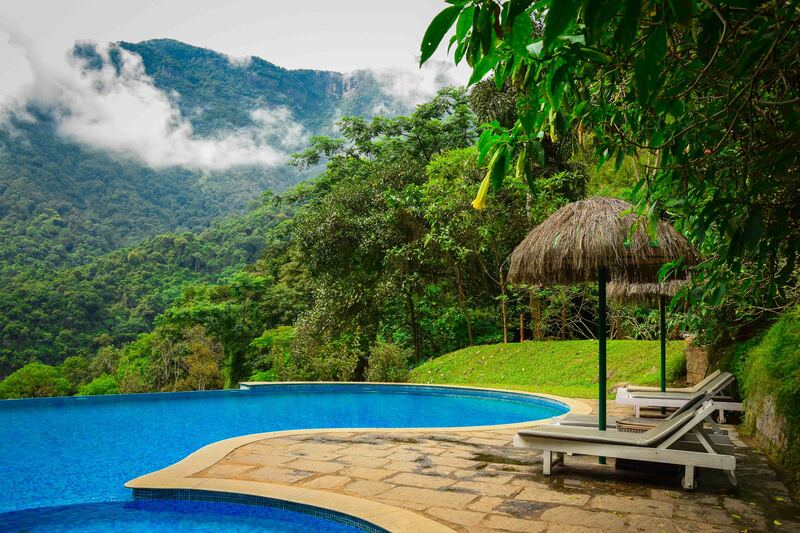 A luxury resort perched over a 10 acres spice plantation along with magnificent vistas of endless forests. Vanakkam! This is how you will be greeted by the staff when you stepped into the thatched open-sided reception of the resort. From shady forest to wide open meadows Kurumba Village Resort is unspoiled. This luxurious property is truly in harmony with nature. With those scenes of joyous celebration, we headed towards our private Villa beside the spring. Traditionally the Kurumbas have subsisted as hunters and gatherers, one of the ancient tribal communities of Nilgiris. These Mountain lover tribes live in jungles on the steep edges of the Plateau. For their living, they practice shifting cultivation. Early settlements were usually isolated, with Kurumbas living in caves or rock shelters. Bananas, mangoes, jackfruit, and chilies were the usual garden produce. Today, with increasing population and deforestation, the Kurumbas have been forced to lower elevations of the plateau and subsist primarily by working on tea or coffee plantations. 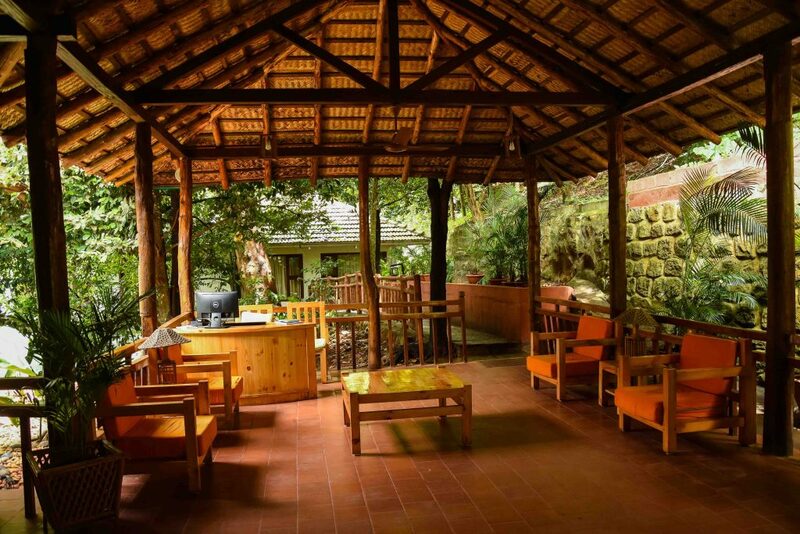 Named after the Kurumbas, Kurumba Village Resort is a tribute to the ancient clan. 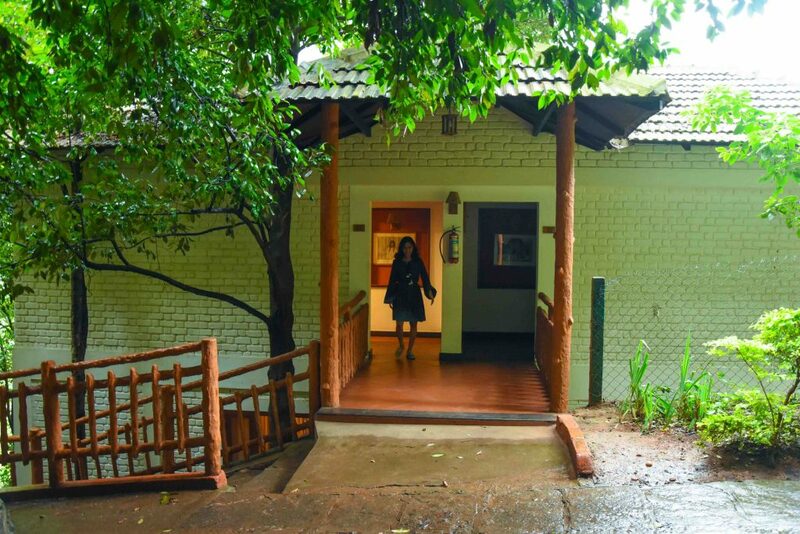 We were invited by #NatureResort for a staycation in their three properties in the Nilgiris. If you’d like to combine a trip to the mountains with luxurious amenities, this is the place to fit the bill. An iconic property in the lap of Bakasura Mountain which offers a vast range of services and amenities. 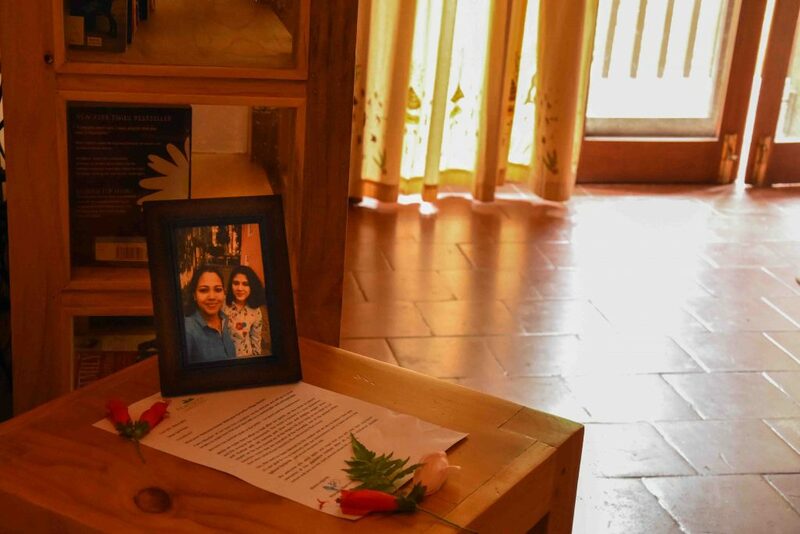 There was a welcome note with a photo frame of ours as we stepped into our elegant Kurumba Suite. Behind the window curtains was the Bakasura Mountain standing with all its glory. We were totally blown away with that mesmerizing view. The window curtains were beautiful, printed with tribal art. And if you are a book lover, then your joy will be doubled the moment you find the mini library in the living room. Do you know what was the very first thing we did ! we brewed two cups of tea and relaxed in the cane chairs stretching our legs on the foot-rest. The aroma of clove and nutmeg were all around which didn’t fail to produce a relaxing effect! Unscripted feelings would enthrall your soul for sure. 2. The Infinity Pool Kurumba Village Resort features a spectacular infinity pool, which is the perfect spot to watch the floating clouds with the backdrop of vivid green mountains. Believe me, You can’t get over this view. This infinity pool is the perfect place to unwind, taking a refreshing dip with a mind-boggling view. You should not miss an aromatic Spice walk with the expert there. He will explain each and every fact about spices like Nutmeg, Clove, Bayleaf etc. Besides, I witnessed many trees for the first time in life. Vanilla vine was one among them. I was amazed how nutmeg gets split into two part when it’s ready to be plucked. 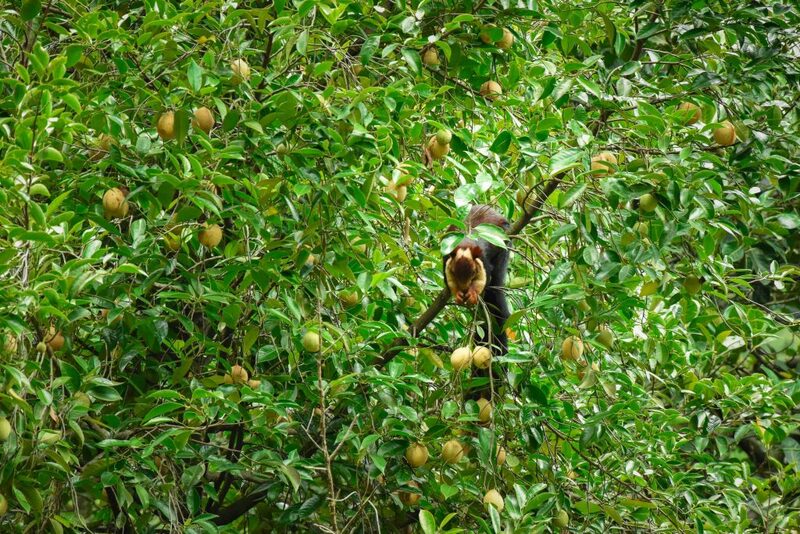 You will spot the Indian Giant Malabar Squirrel and a diversity of birds. I caught the sight of Hornbill birds from my breakfast table too. 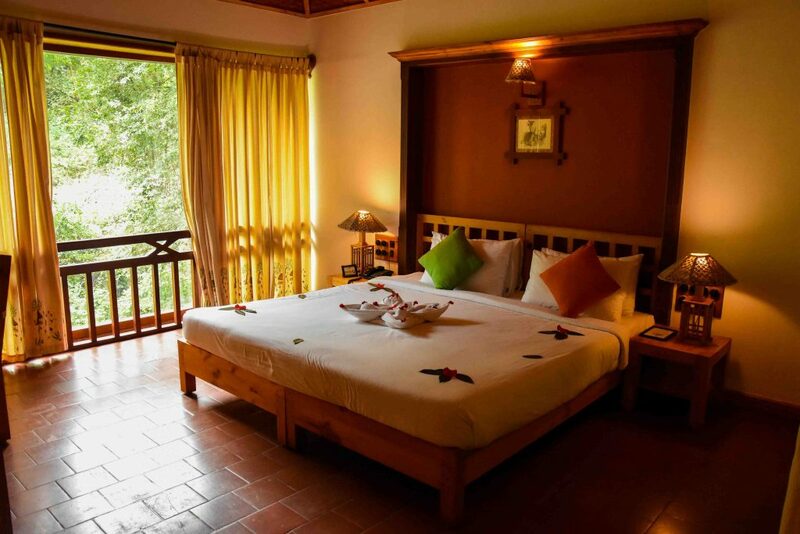 One can also go for Bird Watching that the Resort arranges as a part of their daily activities. Morning birding in the evergreen forest is quite a lifetime experience that one should not miss. It’s a chance to explore some rare birds in their natural habitat. Though spotting a particular type of bird is merely a luck. 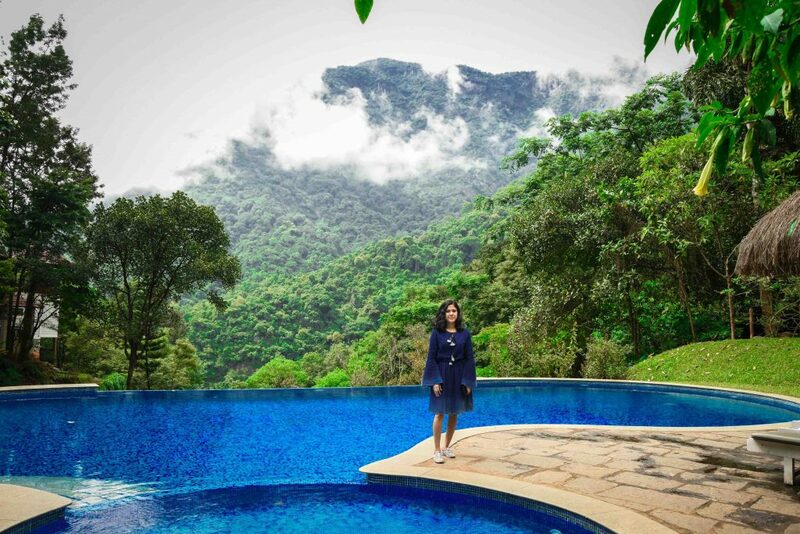 Kurumba Resort gives you a chance to experience the Nilgiris like never before! 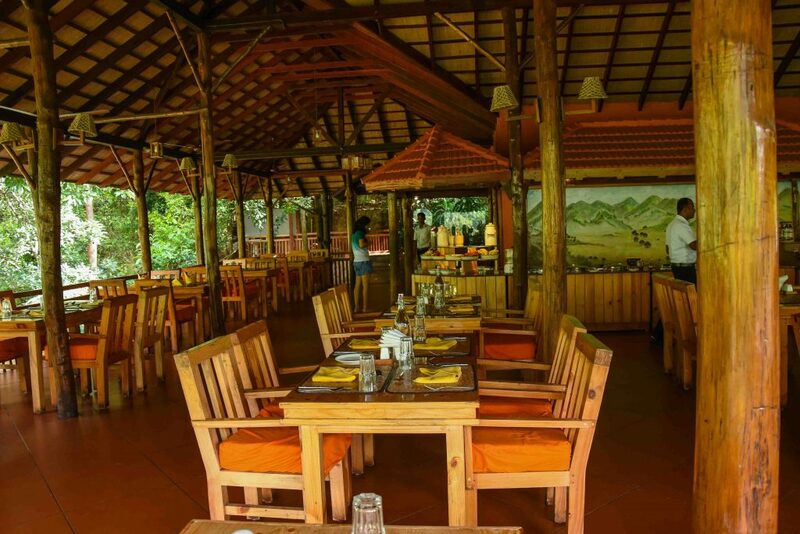 Kurumba Village has many things to offer when it comes to Dining. All you need is to ask and they will quickly arrange a relaxed pool-side dining or a Barbeque in the balcony. Wait, the list is not over yet. 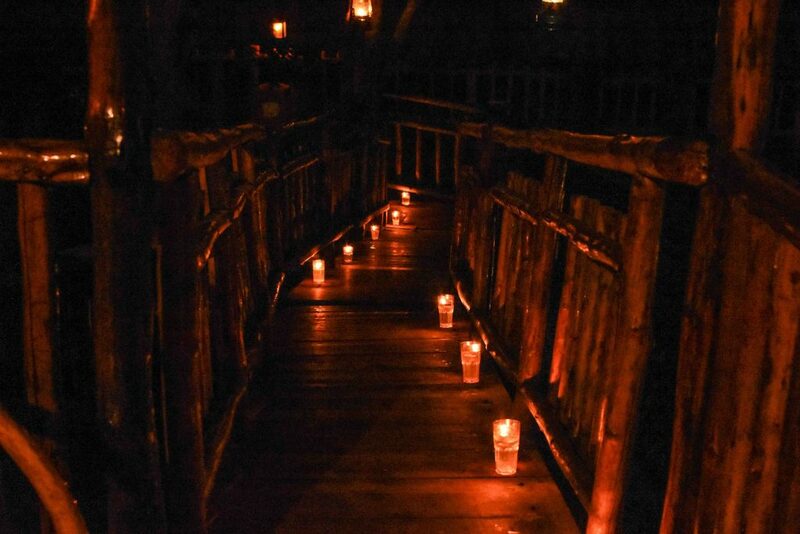 You can also experience a romantic candlelight dinner on the Treetop in the warm intimacy. 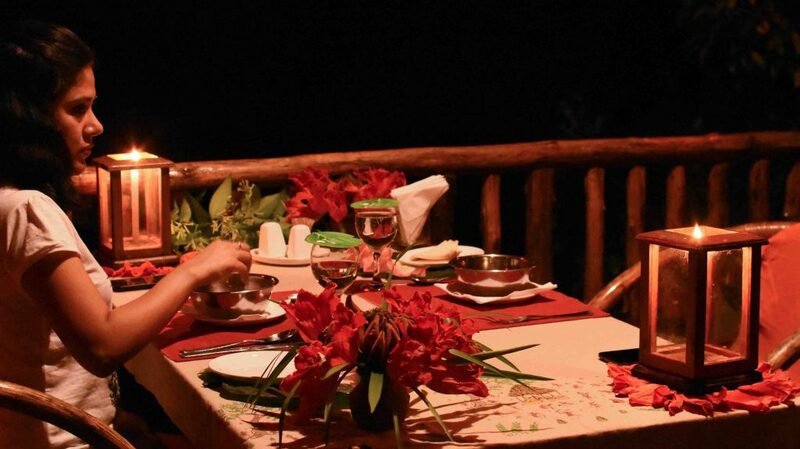 There will be one chef assigned to your table will make some lip-smacking Kurumba specials. We two sisters had a wonderful experience. A one-of-a-kind meal. The show-stopper was the Kurumba Chicken where the chicken was balanced perfectly with Kurumba spices and wrapped in a big cinnamon leaf. Before that, we enjoyed a drink and soup, specially crafted for us. Apart from that, you shouldn’t miss the Chaya at the chai-shop in the evening. It’s next to the pool. Their open-sided restaurant has International, Indian and regional specialties to offer. 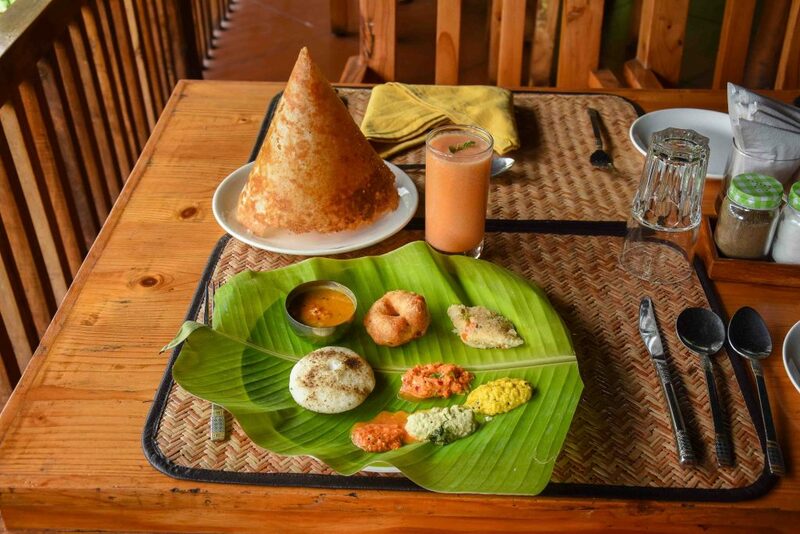 You can also ask to arrange a Cooking Class where you can learn Kurumba specialties or some South-Indian traditional dishes. 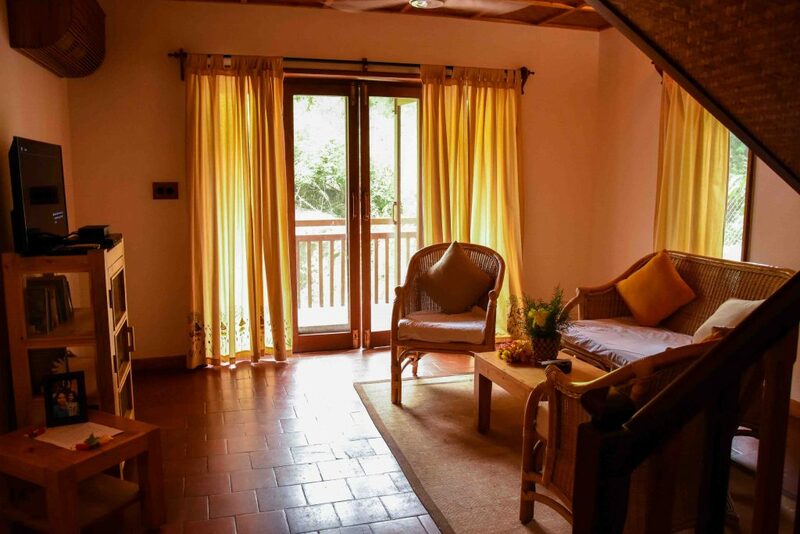 Kurumba Village Resort is built to emerge in an organic way from the earth. The architecture and interior of cottages reflect it very well. They have used local fabrics and tribal motifs to try and give their guests the most authentic experience possible. They have also planted more than 3,000 native species of trees within the resort creating a healthy ecosystem. They have installed a sewage treatment plant where they do the waste management. They encourage the use of bags, made of cloth and newspaper. So as a part of the activity they offer, you can learn to make paper bags. Also, you will be gifted a jute bag as a token of farewell. Thanks for dropping by and spending your time to read my blog. Stay tuned for my next post about the ‘Seven Course Tea Infused Meal’ at Coonoor.